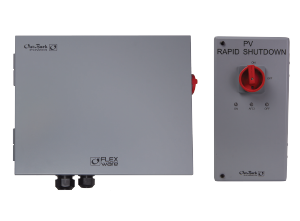 OutBack provides a fully-compliant PV rapid shutdown equipment plus combiner solution with the SkyBox RSD-1. The SkyBox RSD-1 is rated to 600VDC for integration in a wide range of systems and designed for ease of service and clean wire management. Components can be ordered for alternative system needs, including use with grid-direct PV inverters, and stacked SkyBox’s.